It is important you read this leaflet before installing the gate. 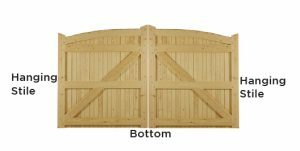 The guidelines below will help ensure the gate is fitted correctly and in a suitable environment. FAILURE TO ADHERE TO THE INSTRUCTIONS WILL INVALIDATE ANY WARRANTY CLAIM. Report any damage to packaging before unwrapping. If no damage, Polythene wrapping should be removed and the gates to be inspected for size and defects. Do not treat the gate if any damage or defects are found. Any damage is to be reported immediately following delivery. Gates must be fully treated before being hung or exposed to the elements. Two way adjustable hinges must be used to enable adjustments for movements that can occur with seasonable changes. 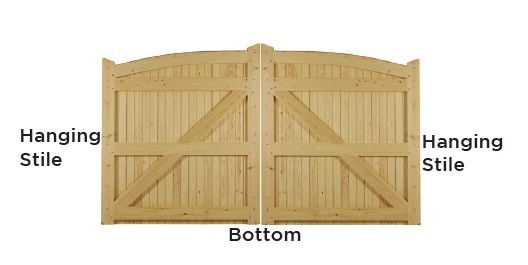 When hanging gates the braces should “rise” from hanging stiles to centre stiles for strength. Manual gates must be fitted by an experienced installer. Automated gates must be fitted by a technically qualified installer. Gates should not be installed as a bi-fold gate. This will invalidate the warranty due to the stresses placed on the joints of the gates.